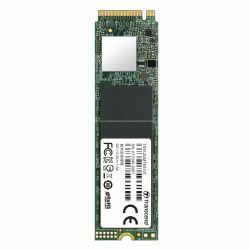 Transcend's MTE510T M.2 SSD is a DRAM-less SSD solution utilizing the PCI Express (PCIe) Gen 3 x4 interface, and is fully compatible with NVM Express (NVMe) 1.2 specifications. The next-generation PCIe NVMe protocol allows the SSD to achieve never-before-seen transfer speeds. The cost-effective MTE510T aims at high-end applications, such as digital audio/video production, gaming, and enterprise use at an attractive price. Powered by 64-layer 3D NAND TLC flash memory, the MTE510T offers not only fast transfer speeds but unmatched reliability.